As part of MIU’s vision to encourage entrepreneurship in Egypt and support its students & Alumni network with bringing their potential business ideas to life, the university has recently signed a collaboration agreement with MAYDAY, an Egyptian start-up (led by two MIU alumni) that provides real-time roadside assistance services via a mobile application. 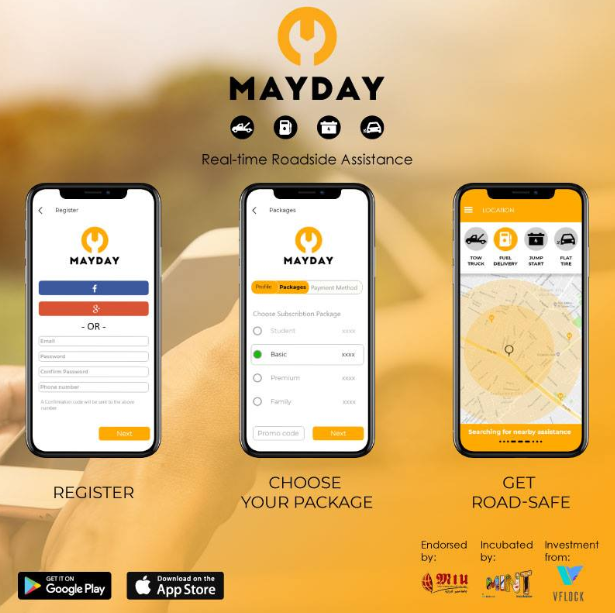 MAYDAY has recently launched its offering across Cairo and Giza to ensure motorists facing car trouble receive top quality assistance and are back on the road in a matter of minutes. “MAYDAY has a mission to provide high quality services to its customers via accurate location tracking, qualified service providers, fixed pricing and carefully designed safety measures to ensure our customers are constantly road safe”, stated Mohamed Abo El Fotouh – MAYDAY founding partner and MIU Computer Science Alumni. As part of the collaboration agreement with MIU, MAYDAY will be working to provide its set of services to the university students and staff members through customized packages and subsidized pricing to ensure roadside assistance services are available 24/7 to the entire MIU family. Look out for MAYDAY’s booth on campus during the first week of October to learn more about the services and offers that are specially prepared for MIU.